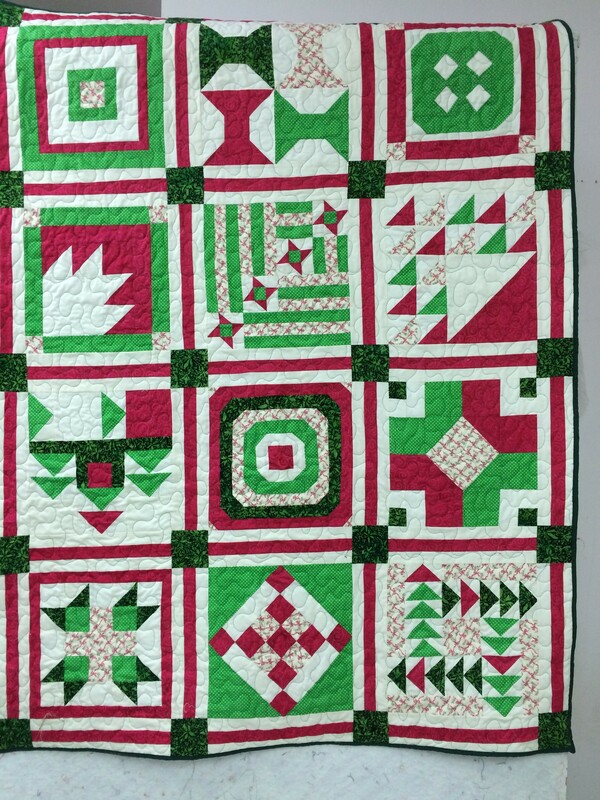 This Christmas quilt was a 2014 BOM and is completed. 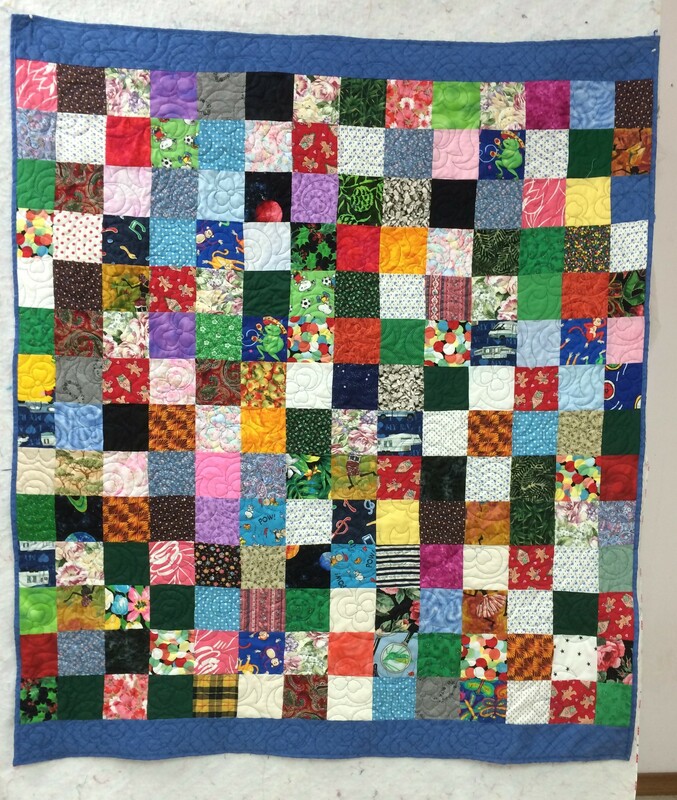 5 of these quilts have been completed and though they are all 40″ wide, they vary in length between 44 and 60′ Today 4 of them were gifted to the church for street mission. I used a heavy batting and since the night temperatures are in the 30s, I’m sure they are welcome. 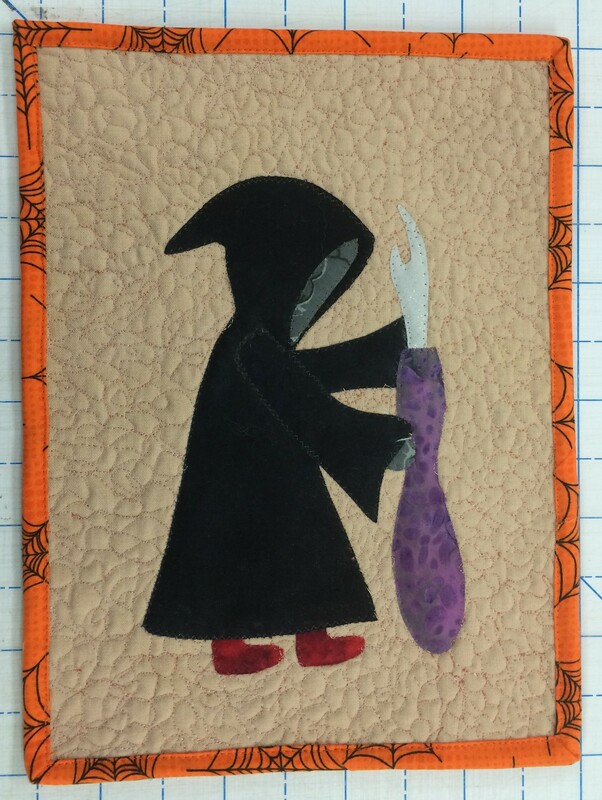 “The Grim Ripper” is a 9 x 12″ wall hanging that only needed quilting and binding. 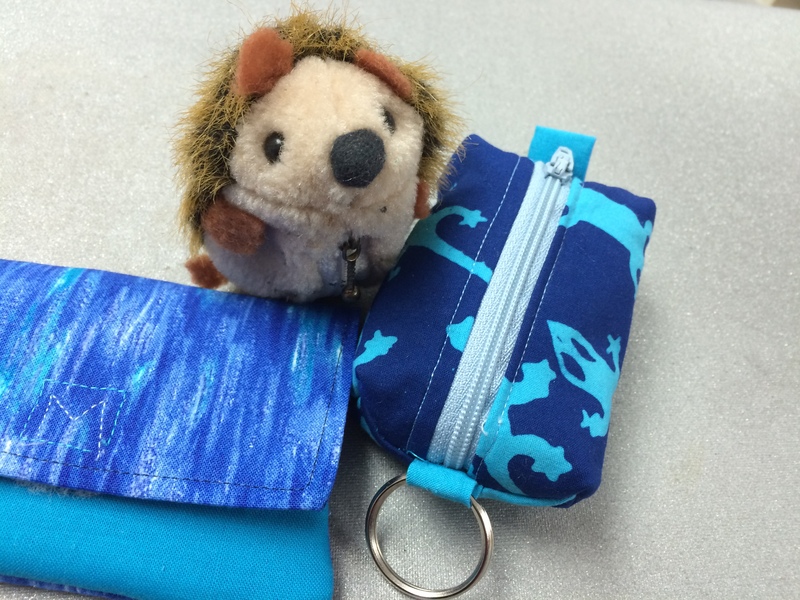 Hedgehog needed the key ring sewn back on (10 year job) and the two little coin purses have gone to a friend who loves blue. These are the first pair of finished socks this year. January 28, I planted Endive, Escarole, lettuce, and broccoli in the back containers. Today’ they are peeking. Yesterday. I planted tomatoes and peppers in these cups. They are inside and under lights since we could still have a very cold February. In addition, the apples and grapes are pruned, a good share of the bark has been laid and the front flower bed is ready for annuals. I’m quite sure that groceries are going up, up, and more up, which is why I really want to have a good garden with loads canned, frozen and otherwise stored. 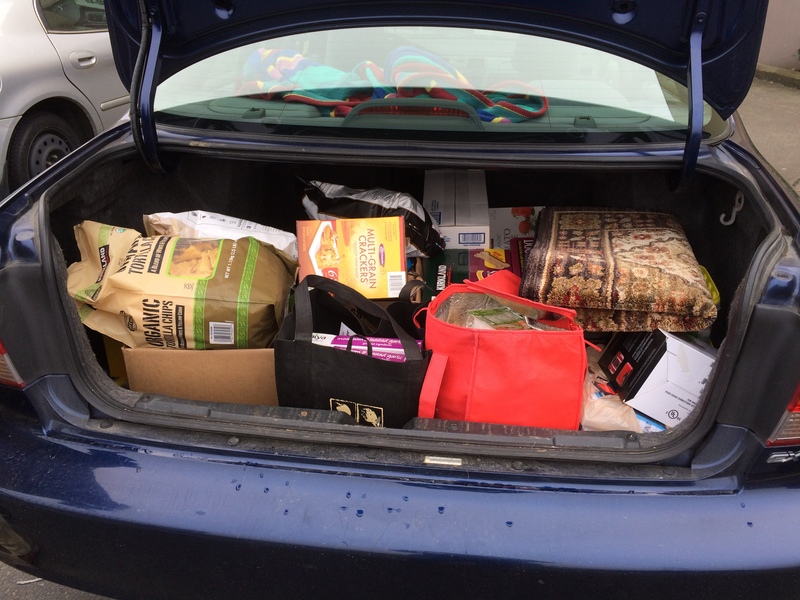 We started at Costco and yes, I know that it is difficult to come out of there with just a few things. However, with what we purchased there today, I don’t think we need to visit the food part of the store for at least two months. To follow that up, we went to Fred Meyer for the items that Costco didn’t have. I have definitely learned that only one of a couple should go to the store, but I don’t know how to put that in practice, when he likes to go with me. When the two of us go, it seems to me that we come out of there with three times as much as either would have purchased. The only consolation was that most of it was long term items, some for the freezer and some like sunflower seeds that I use to make humus. Some of it was for the big Super bowl game Sunday where several are getting together to enjoy the game. After lunch I made zucchini patties for the freezer and for tomorrow. Then I put the rice and lentils that I soaked this morning for flatbread into the blender with salt, onion and garlic powder until it was thick and smooth. I saw this recipe this past week, but I really don’t remember where and since I couldn’t refer back to it, I baked it at 400 for 20 minutes on a silicone pad on a baking sheet, then flipped it for 5 more minutes. 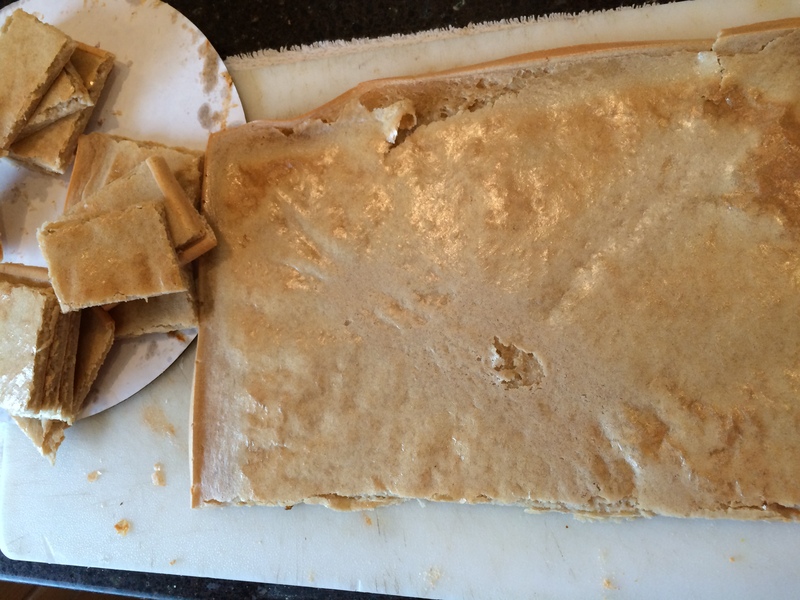 If I had used two sheets, it would have made wonderful crackers. Bill cut it into some small pieces for dipping and some larger pieces to eat with meals. This is a great and easy recipe for gluten-free menus. Then to add some humor to my day, the geese wanted to be herded into the night enclosure. So I put the rest of the birds in and went after the geese. They came to the door which I then opened and the latest three ducks ran out. OK, ducks are out and geese are in. I managed to corned one duck and got it back in and the other two ran off to the pond. So I went into the house. About 1/2 hour later at sundown, I went outside and these two were giving me the what for because they were locked out. So I went down there and told them that’s what happens at night, they better stay in next time. They were very happy to get back in. One just enjoys the animals even with their quirks. These are the Summer Solst socks by Jackie Erickson-Schweitzer. 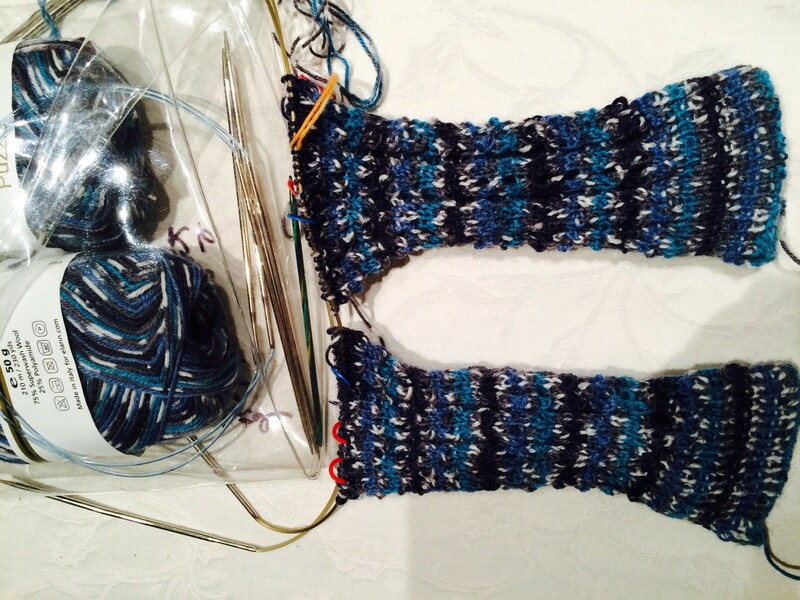 In between everything else that happened this week, I now have knitted up to the heel and have the heel setup done. I’m going back through a book called The Sock Calendar – Socks for all Seasons. 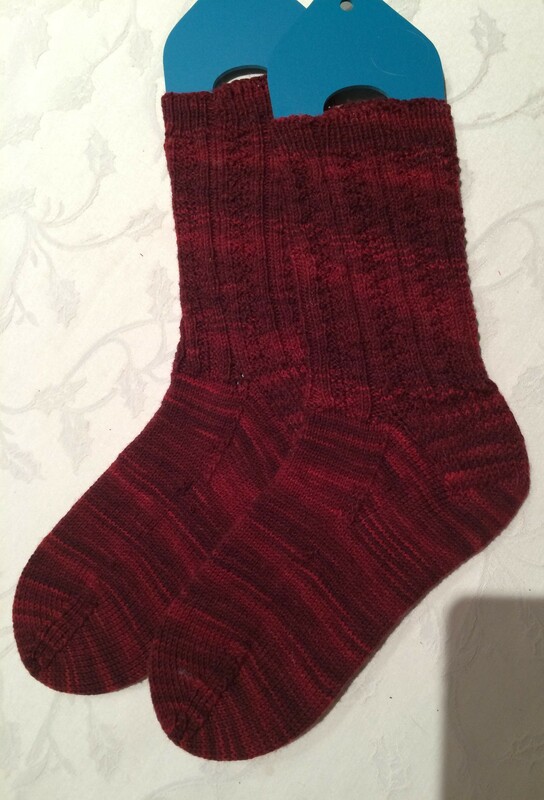 I enjoyed knitting the socks when I purchased the book and have worn some of them out. So it will be fun to knit them in different colors and fibers. 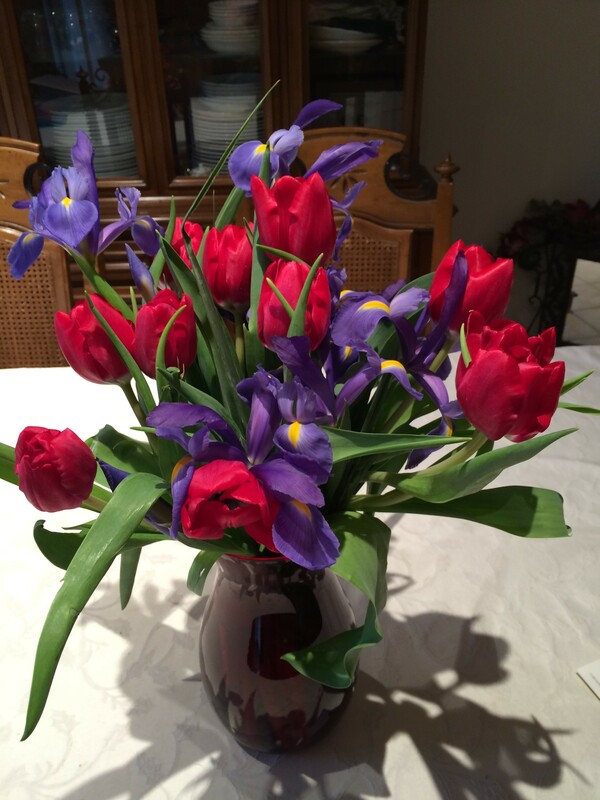 These beautiful flowers arrived for our anniversary and my husband’s birthday, which is today. Of course a birthday needs a celebration, so we went out and used our free burrito coupon and then went to see Selma. I see the pictures and I read the stories, but still I cannot grasp how people can treat others so horribly. At home, I fed the bees again and put some dirt and seeds together. The four trays in the c (on the left in this photo) have kale, celery, lettuce, broccoli and a couple other seeds. I don’t even know if they will germinate as they have been sitting on my dresser all winter. I thought I would get them planted late summer, but it just didn’t happen. So I’m hoping they are still viable. 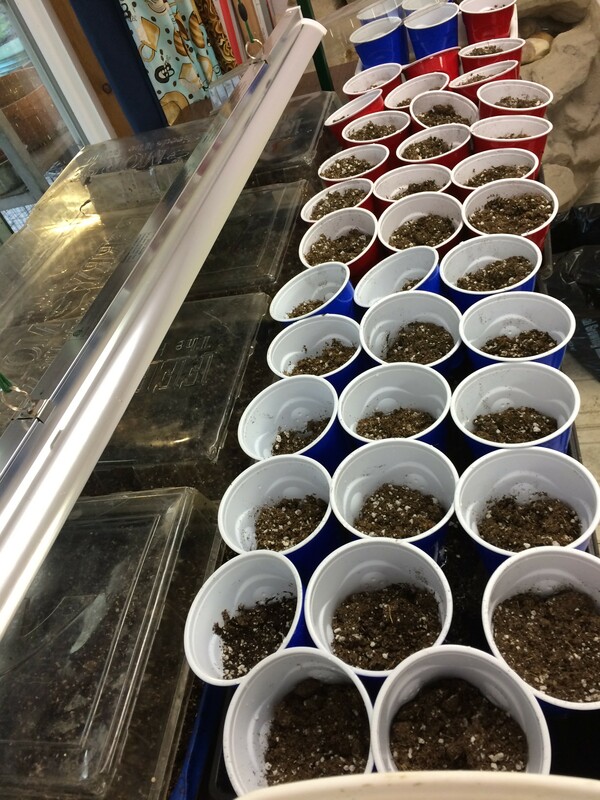 The red and blue cups will hold tomato and pepper starts which seeds were in the refrigerator and should be ok. They are not yet planted. We got up this morning, pulled the sheets off the bed and did all the normal dusting etc one does on bed cleaning day and decided we needed a new mattress and box springs for our anniversary gift to ourselves. After breakfast we spent the rest of the morning looking and trying out bed sets. By noon, we had enough of that as we hadn’t decided even whether we wanted to continue with king size or go down to queen size since we don’t have children invading in the morning. Actually we didn’t have that problem last time we bought a bed set either. It has been a long time since they were that young. 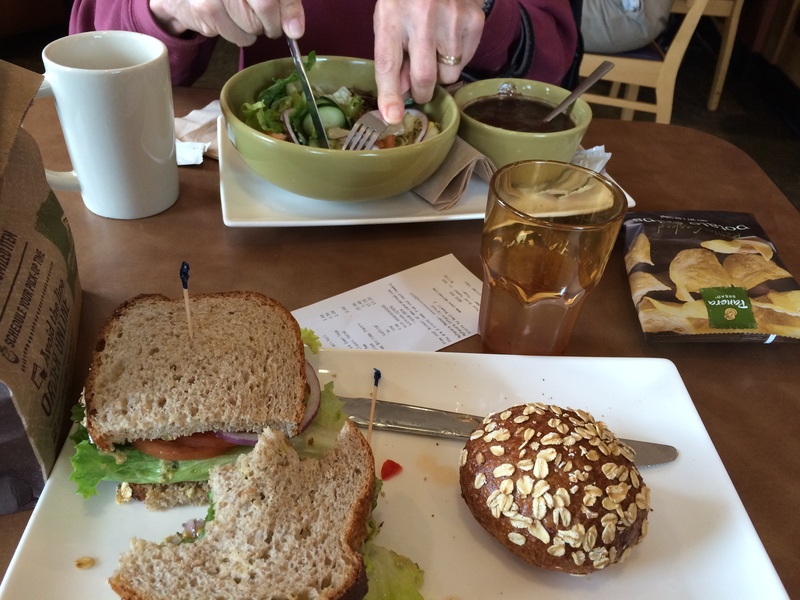 So we wandered over to Panera’s and enjoyed lunch. Our decision was hampered by the fact that we have the frame and bedding for the king size, but we think we want a queen size. We decided to come home, made the bed up with the fresh sheets and will think about it for another month or however long it takes as there is no rush. Then we enjoyed a leisurely afternoon without doing much. Tomorrow is his birthday. We’ll see if we come up with anything exciting for that. But don’t count on it as we don’t usually do exciting. We had a beautiful sunny day, and look at the bees. After being holed up for 3 months, it must feel wonderful to stretch those wings in 60 degree weather. Tomorrow’s forecast is calling for rain, so they will be back inside. It is only January and they won’t have many chances to clean house before March/April sunny days when they will be out looking for nectar. The dandelions are the early ones here. The are quite prolific in early spring. 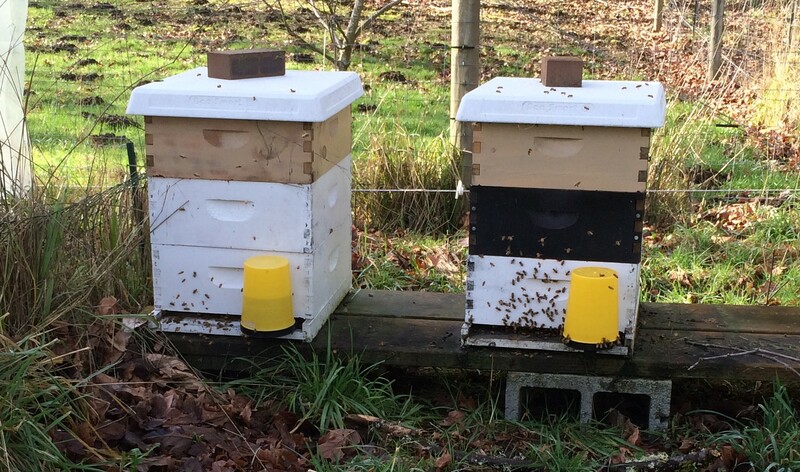 Not only did the bees take advantage of the sun, so did we, with a bit of outdoor cleaning. It is so damp here during the winter that most everything outside turns green. This is the top of the chest freezer where I keep dog food. It sits under a deck, but still was quite green on top. Even our entrance cement gets moss. 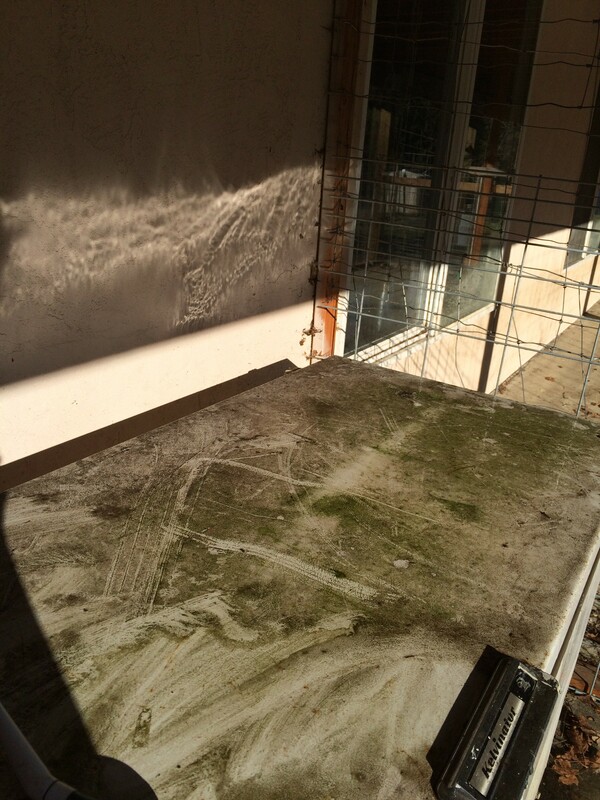 So we did a bit of cleaning. See that shiny part in the middle – perhaps I should have taken the photo before I put in the new light. 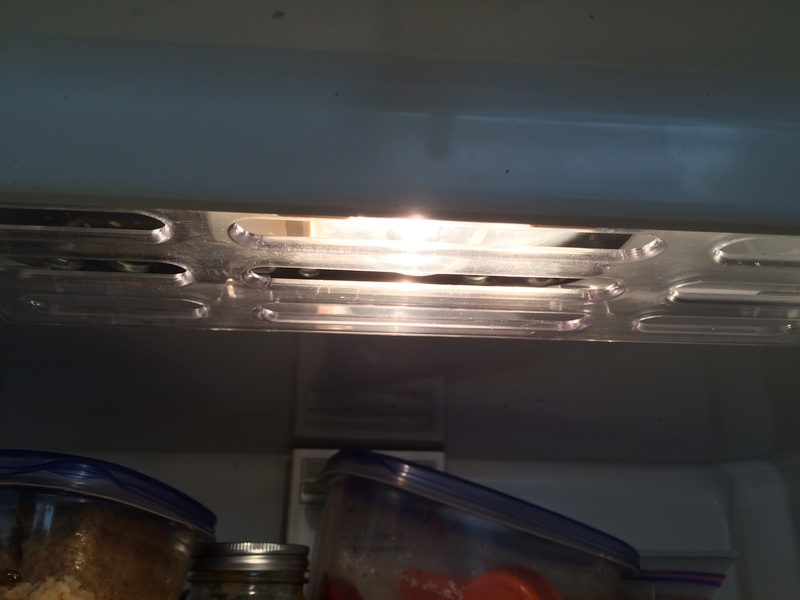 Can you explain to me why the designer had to make it so difficult to change a light bulb in the refrigerator? Fortunately, I knew where the manual was, but it said “remove the screws” which at least told me that the cover didn’t slip up in there in some way. This one has 3 screws that have to be removed with a hex nut driver. How many of us women have those in our artillery? I did have a light bulb replacement. However, I tried several tools before I called the husband for back up. Obviously, making it easy to replace this light bulb was not their priority. And no photo with this but since tomorrow is our 52nd anniversary, and Chipotles was having a special, we decided to go there tonight instead of wait. The special was if you tried their tofu special, you got a coupon for another burrito within the next month free. I was anxious to try the tofu as I love tofu. But they ran out before we got there. We had veggie burritos and they gave us the coupon to come back as well. I think we’ll try for lunch next time, then they shouldn’t be out. Today was totally lovely. The sun was shining – probably about 60 degrees. 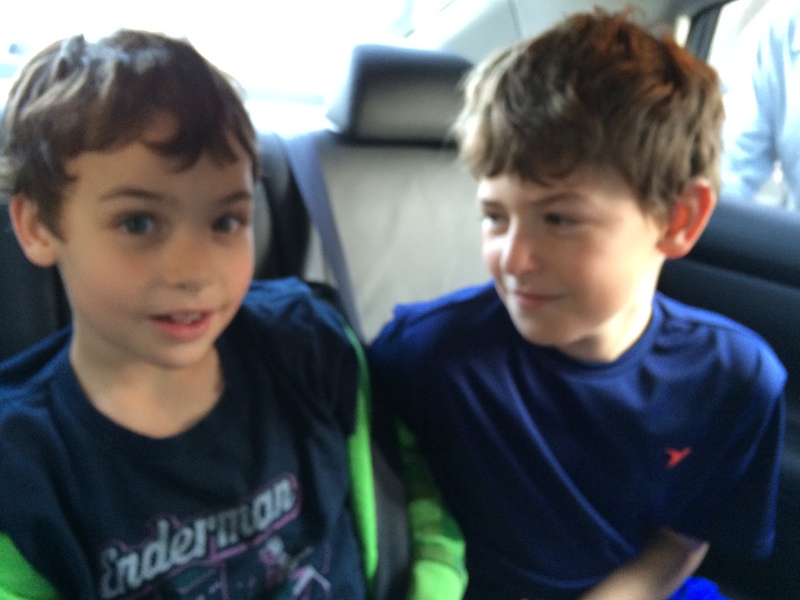 My delightful grandsons came over with their parents. We had such an enjoyable time, I forgot to get any photos. So I took this one, just as they were leaving. They helped my husband get the new ducks down to the pond, had some lunch and went out to play football toss. The 11-year-old is almost eye to eye with me. And there are enough strips for 2 more. 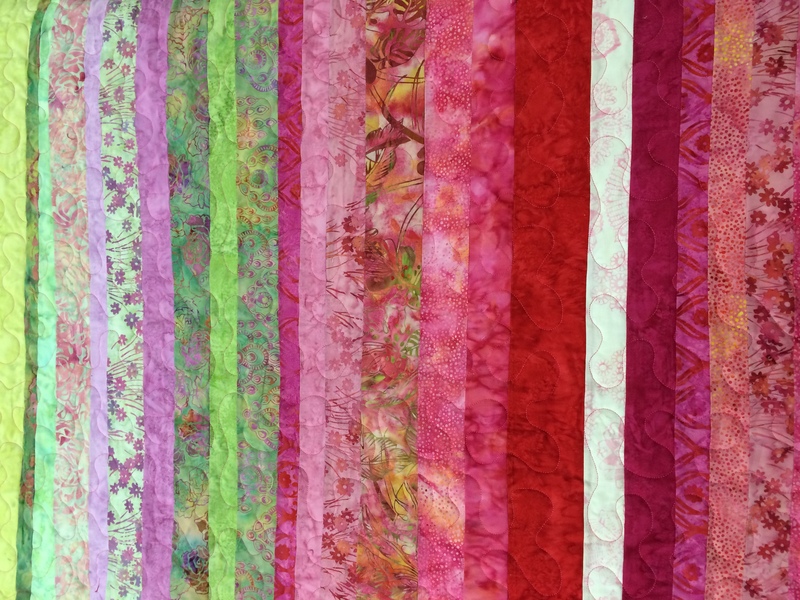 I will be so happy to have these strips finished into something usable. I had them hanging on hangars from which they just kept slipping off when I walked to close to them. Tomorrow will be a garden day, so I’m not sure when I’ll get back to them. I went out and checked my bees and they were out in the sun. I decided to give them a bit to eat, since the flowers aren’t yet in bloom and I don’t know what their reserves look like. 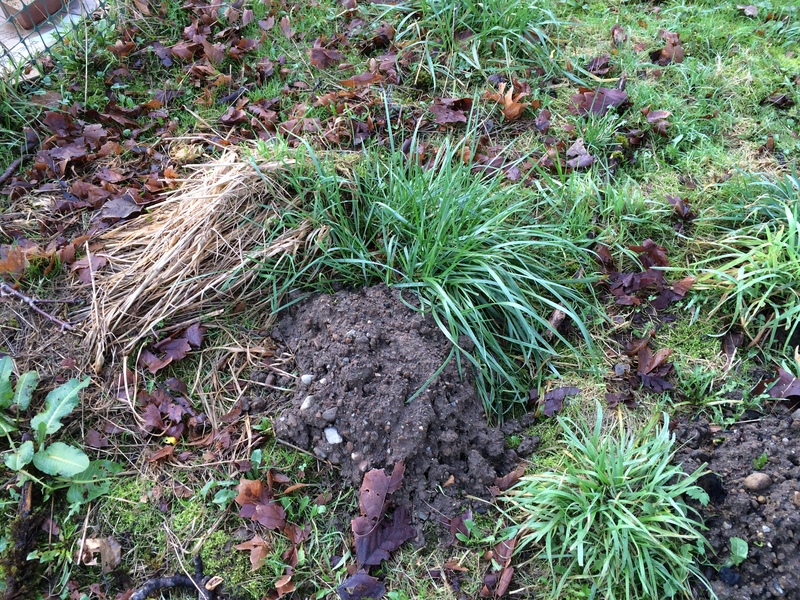 I do know that when the days started getting longer, the queen started laying more eggs. If I make it through this winter, it will be my first year of not losing a hive. Yea, I only have two, but it will be exciting to actually get the bees through the winter. I hope you aren’t tired of these yet. 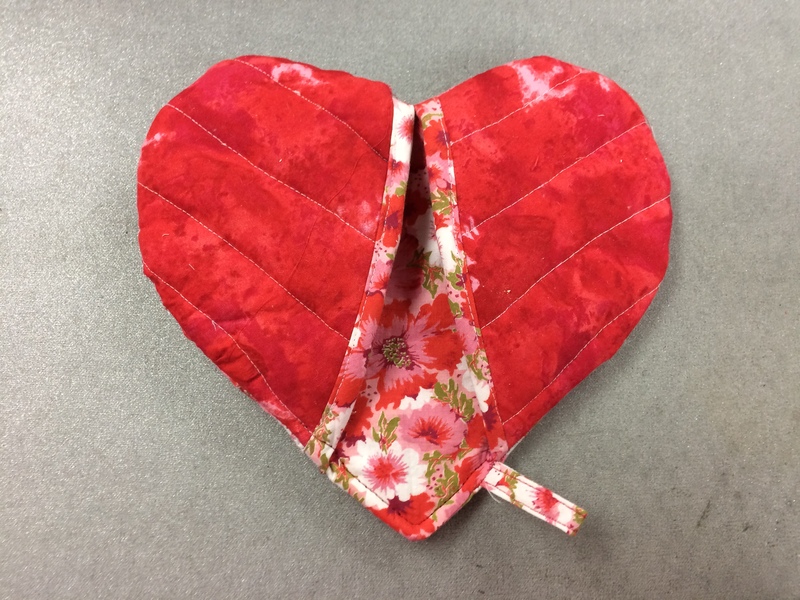 The third one you see here is quilted, but still needs binding. I can get 2 more out of these scraps that we were given. 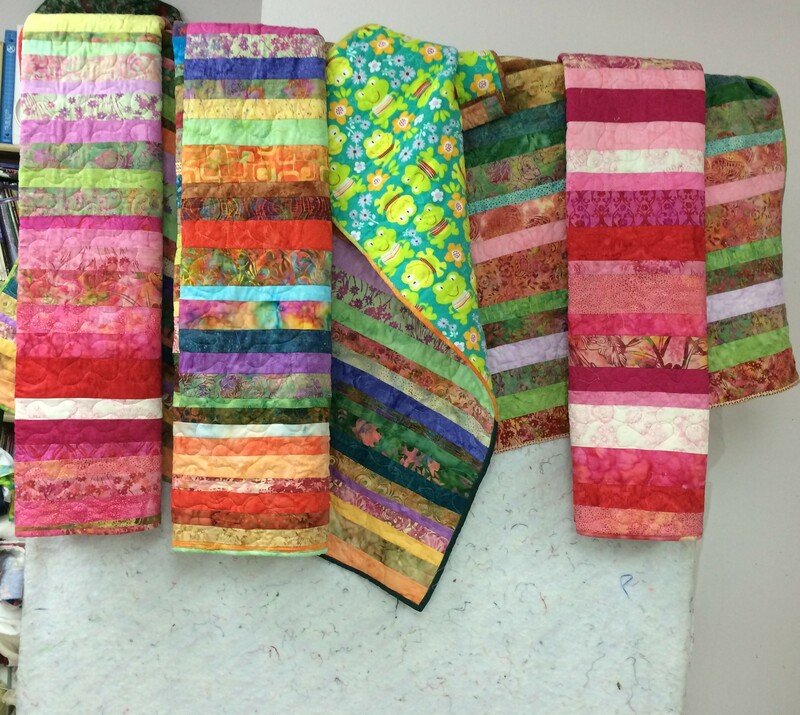 That will make a total of 5 little quilts. I’m putting the same frogs on all of them. 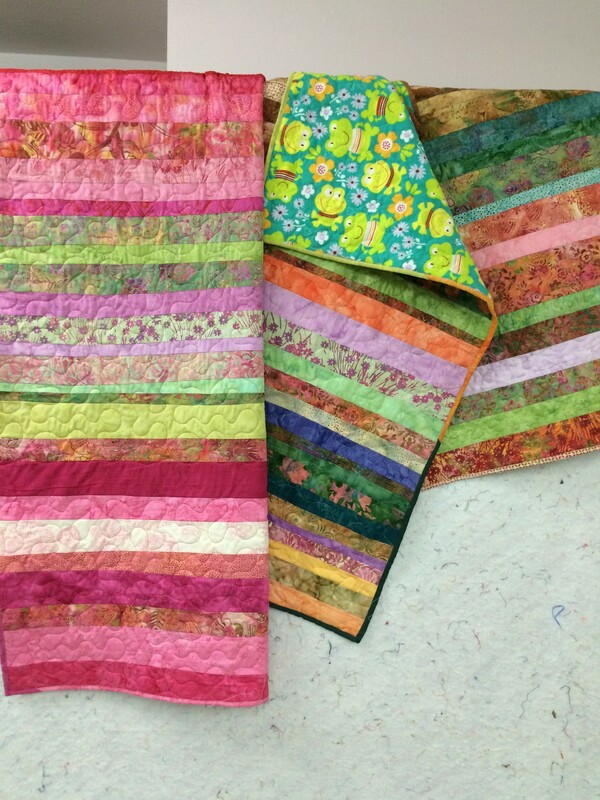 Do you know a child that would turn down nice soft frog fabric? 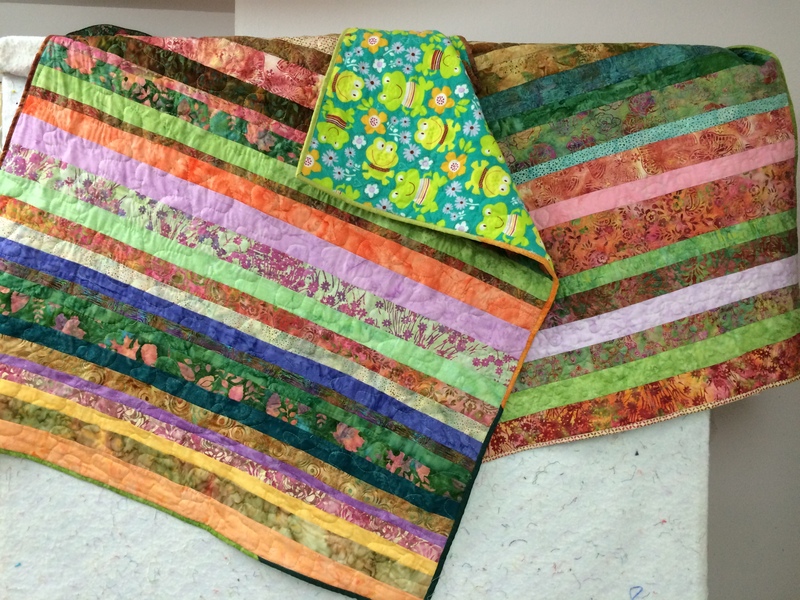 I haven’t finished the seed order yet, but needed a break, so I spent half the day quilting the second striped blanket. I just love the flannel with the bright frogs. And it feels so cozy working on it. Since I spent a good part of the day taking inventory of the seeds I have, and trying to decide how much we eat in a year so I know how many seeds to order, I gave myself the treat of starting another pair of socks. They are self striping, so I think I’ll just go with the stockinette stitch and keep them handy for when I don’t have to think, such as when I’m a passenger in the car or have chatty company. I love starting and finishing socks. Sometimes I enjoy the knitting between the beginning and end and sometimes I just do it unconsciously. This color is “Puzzle” from the “Sock it to me” collection made for Elann.com It is 25% nylon so will readily go through the washer and dryer. Although it has the same number of yards in a skein as most of the other sock yarns I use, it feels lighter, so will make a great pair of summer socks.